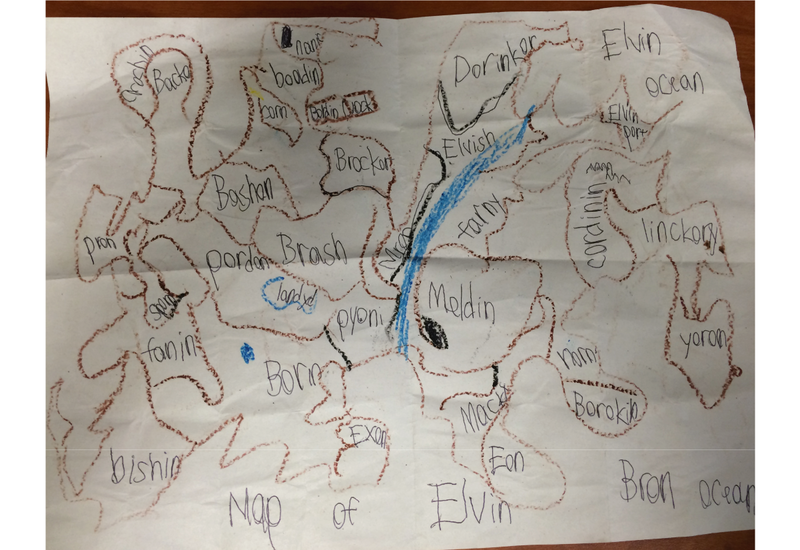 A friend of mine's 8-year old son spontaneously decided to draw a map of a fantasy world. He asked on G+ if anyone could make it "professional". 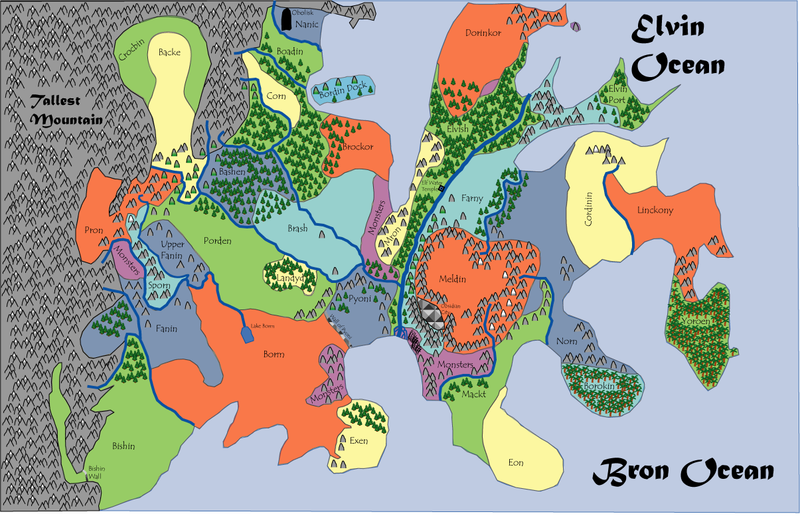 I like making maps. A lot. But I'm not a professional at it - I just like dinking around with it. So I said "yes." This is the Raw version. The next step is to do a hexagon grid overlay and a few other tweaks required by my perfectionism. Then I have to find a way to export it to .SVG format that keeps the fonts. That way they can zoom in and things won't be pixilated. 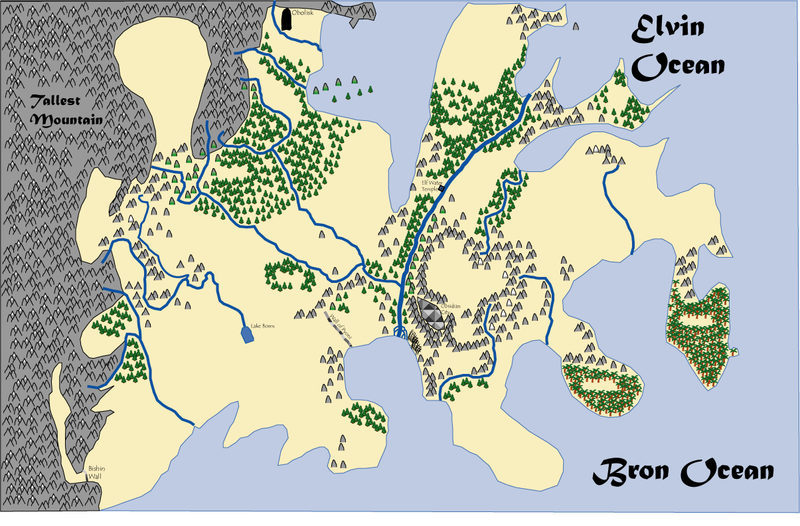 The end result will be a map my friend can used to teach his son RPGs, a map his son designed and will know all the names. That is a great dad. How could I not help? Having finished the introductory short story and started outlining the next story (which will be longer, but not Robert Jordan-longer), I'm thinking over things in the short story. Right now I'm thinking about Epikydes's age. He is half elven (on his father's side), which traditionally means he has a longer lifespan than humans, so he should look younger than his age. That said, does a longer total lifespan mean an equally longer amount of time to reach physical maturity? I don't think so. If it did, elf children wouldn't have the "Terrible Twos" but the "Terrible Twenties". That said, I could see childhood up to puberty being developmentally similar across the standard fantasy races with a differential not appearing until puberty. Put another way, the longer lived races would be teenagers for a longer period. This time would be no longer than twice human standard (who reach physical maturity between 21 and 25 years of age) and proportional among the other races based on total expected lifespans. So elves wouldn't reach total physical maturity until roughly 35 years old and dwarves somewhere between 28 and 30 years of age. So in my story, Epikydes claims to be 18, but looks 15 or 16 to Fadeyka. Thinking about some of the backstory I want Epikydes to have, I'm not certain that's enough time. In my mind's eye, Epikydes "ended his apprenticeship" around age 12, just before puberty (although the numbers in the text imply 13-14, or just after puberty). Medieval and Renaissance children (especially in the working classes) grew up quick, even if physical maturity lagged, so Epikydes was able to "learn what I had to in order to…do what I had to do." After that, he would have wandered several years, learning from the School of Hard Knocks, until he started his adventuring career properly around age 16 or so. This means Epikydes had only about 2 years of adventuring, including the couple of months to decipher the dagger script in Aurelius's journal and then do the research to locate the places mentioned in it. I really want this period to be 8 months or so, leaving about 16 months for adventuring and achieving his current level of competence. I think the next round of edits will move Epikydes's age to 20 and clean up the implied time since he "ended his apprenticeship". (Which wasn't pretty or pleasant and marked Epikydes in several ways.) I think this will make some of the scenes in the next part flow better, particularly the introduction of the paladin. That part's going to be fun - I'm looking forward to writing it. Oh! Also, I'm switching posting date to Wednesdays. It works better for my schedule and I should have done it a while ago. It will still post in the morning at 7:00 CST. This week will be an exception - this is the post for this week. After that, Fadeyka conceded my point and apologized for laughing at me. While I appreciated the apology, not having to keep that particular secret anymore was much more of a relief. We pulled out a couple bags of coins (I had promised Fadeyka there was treasure here), a magical rope (which we used to get back down to the laboratory), and Thorn, a dagger that, in addition to being magical, was part of a set eight daggers and my entire reason for traveling here. I then retrieved my Guild badge from a resting place inside the door and we reclosed the vault. Despite the thickness and age of the stone door, it still swung easily and silently. As we were climbing back down to the laboratory, we heard the sounds of the approaching dwerro. I retrieved the rope (it can untie itself on command) and we started heading towards the surface exit as quietly and as quickly as we could. We eventually lost the dwerro, but stayed as silent as possible until we reached the surface again, just in case. This meant we had little time or opportunity to talk along the way. We were walking through the surface ruins above the dwarven halls. The ruins were a mixture of old human and dwarven architectural styles with trees and shrubs growing rampant around them now. The old dwarven roads resisted the grass growing through them, but anyplace the road had been damaged was now a thick clump of shrubbery. “So you plan to find all eight?” Fadeyka asked. “No, I don’t have to,” Fadeyka replied, “But I want to. Until now I haven’t really found my calling here in the north and was starting to think I’d have to return to the temple having merely traveled. This is much more of a real adventure and Armea Gris is the Adventuring Goddess of Magic, not the Traveling Goddess of Magic. So,” she turned to look at me as we kept walking, “Where to next?" I thought about it before answering. "As far as I can tell, Aurelius's journal places the next nearest dagger in the tombs at Upal Molotok," I replied. "In the tombs," Fadeyka said. "At Upal Molotok," she continued. "The closed dwarven city of Upal Molotok." "Yes," I replied, drawing out the syllable a bit peevishly. "In the tombs at Upal Molotok, home to the ghosts of Upal Molotok, the undead citizens of the closed dwarven city of Upal Molotok." Clearly Fadeyka was skeptical about this plan of action. "Yes, all of that," I said gesturing my hand to indicate all of what she had said. "And how do you plan on entering the sacred district of a closed dwarven city? I suspect they will take exception to us telling them we're only there to desecrate a crypt and take a long buried dagger." There was clearly sarcasm and disbelief in Fadeyka’s voice. "I know a paladin who can get us in," I said lightly. Fadeyka quickened her step to get in front of me and then turned and stopped in my path, one hand out. "Wait. You know a paladin who...no, never mind that. What kind of paladin would help us break into a crypt?" She put her hands on her hips. I took a deep breath and let it out slowly. "He's a paladin in the service of the Queen of Winter Twilight." "The Queen of Winter Twilight..." Fadeyka said half to herself while looking down, mulling over the unusual attribute. It took her a moment as I had translated the goddess’s elven name into the common tongue. Then Fadeyka took in a short breath and looked up at me. "That's Marsuda Wasala, Goddess of the Underworld," she said accusingly. "There are no paladins in Her service. Paladins tend to fight people in Her service. Just thinking about a paladin in Her service makes my head itch." She was actually scratching her head. "Actually, there is at least one," I countered, holding one finger up in lecture mode. "He was part of a group I worked with last year." Fadeyka stared at me, arms still on hips, clearly trying to determine if I was making this up. After a minute or two, she looked down and said to herself, "Travel takes us to new places to learn new things." I'm pretty certain she was quoting scripture from her faith. She sighed, looked back up at me, and said, "Fine. Let's go meet your friend. The paladin. Who serves the Goddess of the Underworld." She turned and we resumed walking to the edge of the ruins where (hopefully) our horses were still corralled. After a couple of minutes, she turned and asked, "Where are we going to find this paladin?" "If he's still in Aldmerrow, he’ll probably be at Markel’s Taphouse," I answered. She stopped again. "We're going to find a paladin in a tavern." It wasn't really a question, more of a statement of disbelief. "Yep," I said, a bit of glee in my voice at her reaction. "In a tavern." I did my best to hide my grin as I caught up to her, but I could tell it was leaking out a bit. "You're buying the first round," Fadeyka said as she resumed walking. "And if there is no paladin of the Goddess of the Underworld there, you're buying all the rounds." "Agreed," I replied. "But if he is there, you buy all three of us the steak dinner." "Deal!" she said, stopping walking just long enough so we could shake hands on it. We then continued walking to get to our horses, each satisfied with the bet we had just made.